The product is absolute nonsense, a flagrant money-grab; the illustration, however, is a definitive representation of the dungeon crawl. The main figures prepare to battle in three dimensions, while the bordering monsters, pitched in darkness, await the survivors in two (torches first, heroes; you can’t fight if you can’t see). Otus distills, in a single monochrome image, the suspense, danger, and otherworldliness of the fantasy RPG. See more early illustrations of role-playing here. The Adventure Log is billed as the second “playing aid” produced by TSR for AD&D. The first was the AD&D Rogues Gallery (below), also from 1980, also illustrated by Otus. Shaving kit bags were often used as dice/accessory bags. A brilliant solution, really. I also “borrowed” a few faux leather coin purses from my mom: no latch, you just squeezed the sides of the thing and it popped open. One of the guys has a Trapper Keeper, and there’s another one on the shelf. Wish I could see what those books were. The “Wizards and Fighters” set is here. From the makers of the AD&D Cool, Cool Candles and the AD&D Woodburning Set (!). The diorama set includes “semi-precious stones and foil for decorating”! Looks like the same art used for the LJN action figure cards. The backgrounds are very well done and might be the work of Ken Kelly. LJN released several sets (6 total, I believe) of D&D puffy stickers in 1983 that are still pretty easy to find. The Larami releases, however, are extremely rare. I’m missing at least one of the sets. These sold on eBay some time ago for hundreds of dollars. All of the characters and monsters seen here appear in the Dungeons & Dragons animated series. I know because my four-and-a-half-year-old daughter has been watching the show obsessively for the last several weeks. My youngest (19 months) much prefers Thundarr the Barbarian. Elmo is a close second. The geek and “Dragon Master” is Michael Hughes, a writer, teacher, performer, and occultist. 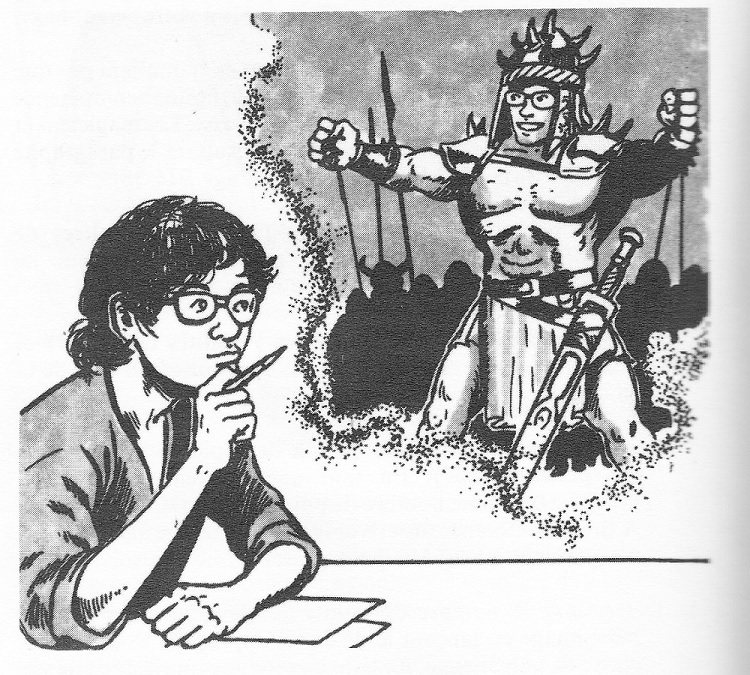 Hughes founded the D&D Club at Andover High in 1981-1982, and, as luck (or fate) would have it, one of his homemade adventure modules appears in a compendium I wrote about a couple of years ago, The Habitation of the Stone Giant Lord and Other Adventures from Our Shared Youth. Mike talks a bit about D&D and The Habitation of the Stone Giant Lord here. At the link you’ll also see an old school character sheet for “Grey Wanderer,” a half-elf ranger/cleric who possesses suspiciously high ability scores—though not so much in the way of looks, poor fellow. You’ll notice “Chaotic Good” listed under languages. That’s not a mistake. “Alignment languages” were a thing in the early versions of D&D and AD&D. If you’re into Lovecraftian horror, do check out Mike’s novels Blackwater Lights and Witch Lights, published by Random House.